Sample Itinerary: This itinerary is intended only as a “sample” and will vary based on the tour chosen or on availability of event site. Choose from several different itineraries and levels of comfort: Here is just one sample itinerary…..
​Upon arrival at the Orvieto railway station where your guide will meet you, you will be taken to the beautiful, comfortable villa or boutique hotel chosen for your tour to get settled into your room and rest near the ancient hill town of Orvieto. Depending on arrival times lunch may be in order. Or possibly, if later afternoon, then an aperitif with wine! Maybe a walk in the area after a brief trip orientation to get our bearings in the new surroundings. Remember, the evening dining experience in this country never begins before 7:30 when eating out. Now let’s get a restful, good night’s sleep! Breakfast will be the first order of the day, which is included in the cost. We will plan to leave for a morning excursion between 9:30 and 10:00 a.m. which will last until lunchtime. Guests may wish to rise early to walk in the surrounds before we go on our day trip. 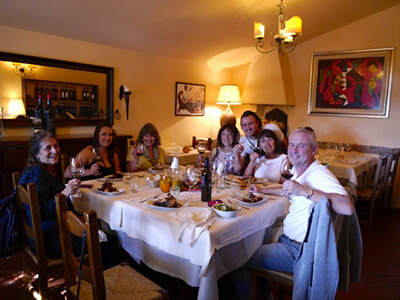 We can be flexible with our time in a small group, but will want to be sure to accommodate Italy’s schedule. Everything except eateries close from 1:00 – 4:30 p.m. for lunch and quiet, including most museums and cathedrals. We will take our long lunch and afternoon as the Italians do! So, after eating, you can choose a nap or some exercise (yoga, walking, stretching?) before gathering as group again and going on to our next event. That may be a museum, an archeology site or an appertivo. Today’s adventure may be to Lake Bolsena, the oldest, largest and cleanest volcanic lake in Italy. It is large enough to support eight towns around its circumference! And it has a lovely, pristine little medieval town overlooking the lake, as well as an incredible Etruscan archaeological site that goes back nearly 4,000 years. A fish lunch here is divine and the local wines are splendid with the fish. We will spend the better part of our day in this area before returning home for some leisure time and later dinner in a special place. We will provide plenty of downtime for those who needing more relaxation or a short activity for those who like to keep going. 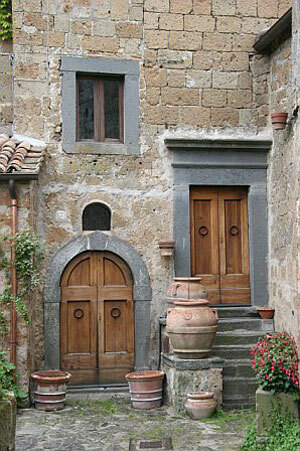 Today is perfect for visiting the ancient hill town of Civita d’ Bagnoregio. Don’t forget your camera as you will be astounded by the 360% views of Umbria and Lazio that come with this day’s excursion. This ancient hill town has an astonishing history and it is still undergoing some controversial changes, which your guide will inform you of when we visit. Lunch in 500 year old cantina where they still have the donkey-driven olive press and toast the bruschetta in the fireplace? Sounds good! How about a stop on the way out of town at the local bakery for some authentic Italian baked goods or a stop at the award-winning gelato shop? This day will leave you breathless with images and possibilities long before our next dinner adventure. If we are in the villa we may choose to eat in and have one of the local cooks prepare our meal. 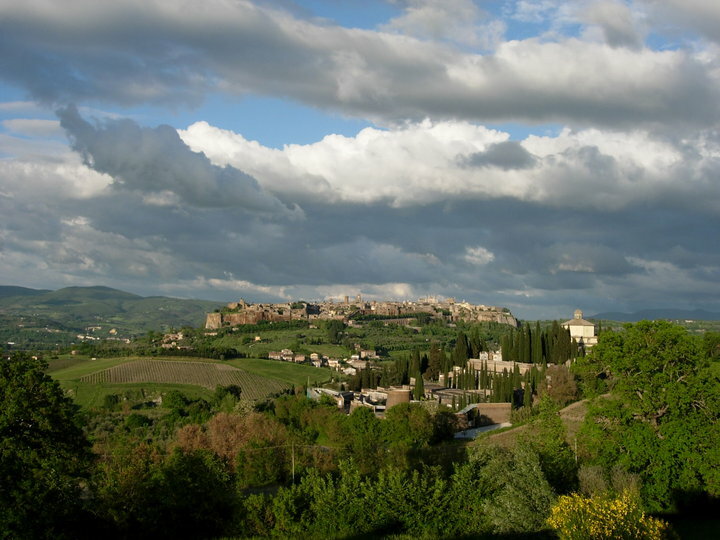 ​Today our excursion takes us to Orvieto, a lovely hill town with much to see. The cathedral, which is rich in history and art, the Etruscan museum, and lunch in a special restaurant. Orvieto is famous for a lovely white wine, which might be incentive for some wine tasting, and interesting shopping. YES, shopping! This is the town for some great ceramics, jewelry, textiles and art. Prepare to be astounded by the 1200 year old cathedral, one of the grandest in all Italy. We will also take a tour of the amazing underground and see how the Etruscans learned to survive when under siege by other cultures. After lunch guests will have the rest of the day to shop, wander the beautiful neighborhoods, take pictures or just relax in a cafe. This will be a full day, so after a rest and freshening up for dinner in a small, local restaurant. Late morning we will head out to Locanda Rosatti for our cooking lesson with Nicolo. The next two hours will not just be informational and hands-on but loads of fun in the Rosatti kitchen. And the best part will be lunch once we have prepared it. 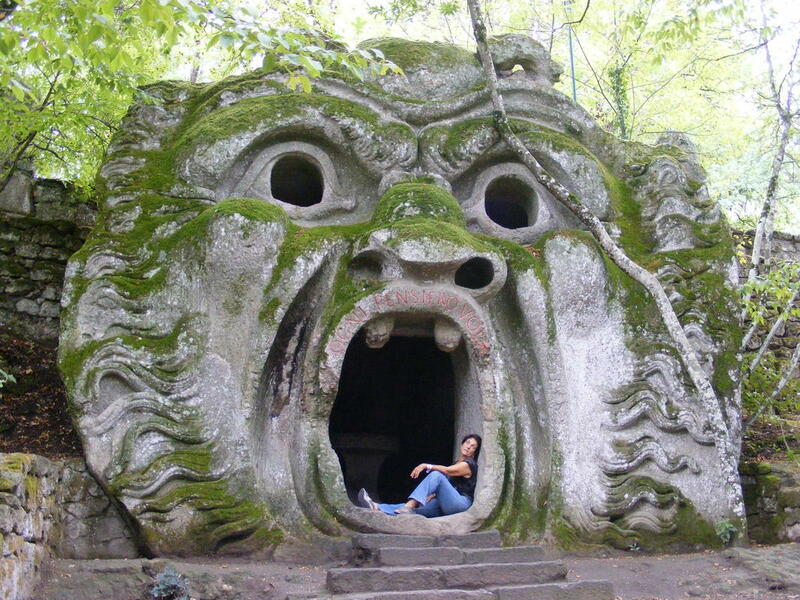 After lunch we can take a ride out to Bomarzo for a walk around this amazing peaceful estate full of statuary which is just one example of the Italian love for gardens. The over-sized, whimsical stone statues dating back some 600 years will provoke your imagination to new heights. No, dinner is not forgotten and as always will be special with delicious fresh, local dishes and great wine. Today may be spent visiting the three ancient towns of Sovana, Sorano and Pittliagno on the centuries old Etruscan trail. Each town has something special to offer, whether it be local artisans and great shopping in tiny little shops, magnificent architecture in the form of churches or one of the oldest Jewish ghettos in Europe, preserved by the town to honor the tiny Jewish population in town (3)!. These serene, fascinating villages will transport you back in time with their magical ambiance. One our way home a wine tasting perhaps? Another option is to go back to Orvieto and check out the farmer’s market today. We might find some fresh ingredients that will motivate us to cook our own dinner this evening. And we will have a nice stock of wine at the villa to pair with the meal. This will be our last full day together so we will travel south a bit to visit Otricoli, a tiny town which was once the main port on the Tiber River for transporting olive oil throughout Italy, some 2000 years ago. Today it is so sleepy and sweet that it has only two restaurants, one small hotel and only 500 residents. But it does have a spectacular estate with Roman ruins to rival any of Rome proper’s ruins. Maybe today we will picnic here, visit the little farm that produces its own cheeses from their sheep and if you like to draw or paint, bring your paper/pencils or watercolors to capture the serenity and beauty of the area. A farewell dinner is in order this evening to celebrate our week together. And an early evening so packing can be accomplished for departure. Departure day! Hopefully, you have packed and are ready to leave the villa after breakfast, by mid-morning. Depending on each guest’s plans for departure; some will be extending their trip, some leaving for the airport to go home, we will sort out the departure plans and make sure you get to your particular destination. IMPORTANT: When making flight plans, remember that it is about 2 hours from Orvieto to the airport in Rome. For departure it would be best to get a flight out that leaves at noon or later. Otherwise, think about staying overnight near the airport, or as some will want to do, extend your trip and stay on in Rome, or explore some other part of the country you are interested in. We would be happy to help you plan for this, if you let us know what your interests are. It is also possible to fly in and out of Florence, then take the train, about 2.5 hours to/from Orvieto. Optional: We can organize morning yoga or stretching or nature walks if you are interested in joining. When you are ready to make travel plans, please let us know and we will give you many good tips for travel, packing, choosing the right airline, hotel, etc.